On the way to school that morning, Jerald Coyote and his sister Dotty were riding on a front seat, talking with bus driver Stinpson Mink about ambitions Jerald beyond school...This was Jerald's senior year of high school, and his class (Class of 1960) would be graduating in another month. Meanwhile, Clarence Coyote and his neighborhood sweetheart Cheryl sat snuggled up together during the bus ride to school as they had been doing since they had gotten to know each other...Clarence and Cheryl's grades in school had been pretty good, thus they would be passing the 3rd grade...Jed, Rex, Donna and the other cubs they ride the bus with also had pretty good odds of passing the grades they were presently in, except for Gail skunk. She wasn't yet failing in her grades, though she was keeping her grades only barely high enough to pass. If Gail did fail the 1st grade a 2nd time, that would put her being in the same 1st grade class with her younger brother, Dennis, when he starts school in September. However, for now...It was only one month away, right to the day, of it being the last day of school before summer vacation begins, and graduation day for the seniors. Upon arriving to school, Stimpson Mink let his cub and teen passengers off as they were excited about May being the last month of school before the summer vacation...For Jerald Coyote and other seinors at the school, a couple of whom ride the same bus, it was even more exciting that May was the last month before graduation day. Samantha Badger's 1st grade class started out that day as normal as would be any other day. Class began with the Pledge of Allegiance, followed by the morning announcements, via intercom, by elementary school principal Monty Wolverine. The first subject Samantha Badger covered that day was arithmetic...And there were no goofy answers given during oral discussion, like in 21st century classes. Nor were wrong answers counted correct via Common Core curriculum...Common Core didn't even exist back then. Mrs. Badger then had her class do an arithmetic assignment. Later into the morning, Samantha Badger had her class practice a writing exercise, in which the class would print phrases and sentences with the letters the cubs learned earlier in the school year. During the writing exercise, Samantha Badger had to deal with a discipline issue that disrupted the entire class, which involved Gail Skunk, Tommy Coatimundi and Ronnie Cougar...The disruption was soon resolved to result of the three cubs having to write one of those '100 times I will not do' assignments, plus Gail Skunk being given a note to be signed by her parents, Pete and Tabetha. When Gail Skunk arrived home from school that afternoon, as would be expected, Mama Tabetha Skunk told Gail more of those, "the devil's gonna getcha if you don't watch out" stories when she saw the note from Gail's teacher. Daddy Pete still disagreed with Tabetha trying to make the cubs think that kind of stuff, But Daddy did give Gail a few good whacks with the paddle. Donna Coyote is in Mrs. Samantha Badger's 1st grade class with Gail Skunk. At the family residence of Al and Marge, after Al came home from work, he mentioned that Poindexter Fox's Uncle Nickolas and the two others from Area 51 had come back from Groom Lake that day to assist in repairing the time Machine. "It's been three weeks since Professor Nickolas Fox was here last wasn't he? ", Marge asked. "It's been right at three weeks", Al said to Marge. "Nickolas Fox said today he and the others can devote time to working on the machine through the 13th". "Oh that's wonderful", Marge said. "That's up until ten days from now". It seemed like everything was now going along okay on the time machine. The cubs have been playing in the neighborhood late in the afternoon after school, and it was getting close to sunset. Some of the cubs still stayed out late playing, including Clarence and Cheryl, as Clarence was letting Cheryl have one of her plushie toy animals take rides in one of Clarence's toy trucks. There was also a wooded area adjacent to the neighborhood that Cheryl and Clarence started to go back in to catch bugs...so they say. "Cheryl", Cheryl's mom, Wanda called. "It's time to be coming in". "Clarence, where are you? It's getting dark", Marge called from the house. "We're over here", Clarence called out to Mama Marge as he and Cheryl came out of the wooded area. "What are you two doing in the tree patch? ", Marge asked. "Cheryl spoke up and said, "We were catching bugs". "Wanda said, "You two are liable to run into a snake or a scorpion in there this time a night". "Okay, Mom", Cheryl acknowledged as Clarence agreed. "Where were they? ", Al asked Marge. "In the tree patch", Marge said. "In the tree patch? ", Cheryl's dad, Frank, asked. "We were catching bugs", Clarence used Cheryl's excuse. "Well, it's getting too late for cubs to be running around out here", Al said. Cheryl and Clarence then pick up their toys they were playing with on the street side, then followed their parents to their homes. wondering what were the two cubs were doing catching bugs this time of night. As Al and Marge continued to discuss the matter that night over some coffee at the dining room table, Marge did mention, "I have noticed Cheryl and Clarence getting more fond of each other". "Right", Al agreed. "There is a the matter of the two cubs feeling a strong bond for each other by the time Clarence is able to leave to go 58 years back into the future". "On that count, didn't we decide a while back on that old saying, 'to love and have lost is better than to not have loved at all'? ", Marge asked. "I know. But it seems like Frank and Wanda always encourages them to become closer as friends", said Al. "That will make it rough on both Clarence and Cheryl when Clarence is able to leave", Marge replied. "It's as though Frank and Wanda has high hopes of Clarence and Cheryl going steady and getting married someday". "That's why Frank and Wanda should know about Clarence", Al said. "It's getting about time I should bring it before Nathan Collie tomorrow to authorize telling Frank and Wanda. "We know Frank and Wanda well enough to know they can be trusted with a secret", Marge said. Al said to Marge, "I know. But because the time machine is classified material, It has to be cleared through Horizon with military officials first in order to tell Frank and Wanda...And if it gets above Nathan, someone above him is going to want to know a good reason why". "So Nathan Collie can act on his level to authorize a release of classified information? ", Marge asked. "To a small degree, if it's a special situation where it's critical to the success of a project", Al answered Marge. "And even then, he's putting it on the line when he makes that kind of a decision". Al further added, "Professor Nickolas Fox should still be around until the end of tomorrow before he and the others leave for Groom Lake. He might give some input on this situation too". So before going to bed for the night, Al and Marge agreed that when Al goes into work tomorrow morning, he will bring that matter before Nathan Collie. That day started out around 60 degrees, with it expected to get up to 90 later in the day...Even though it was still spring, it did feel like summer had arrived. "Watch out for bad luck", the neighbor cubs would say on their way to the school bus stop. "I know. Friday the 13th", said Randy Fox. "I'm hanging around with Buster Rabbit at school today", said Gail Skunk. "His feet will bring me good luck". Then, Zachary Bobcat Jr. teased Gail Skunk with a wisecrack that got the others laughing. "Knock it off! ", Gail Skunk retorted. Jerald Coyote called Zachary Bobcat down for the remark. Senior high school student, Jerald Coyote, being the the older adolescent of those at the bus stop, was given the responsibility of seeing to it the cubs behaved until they boarded the bus...Which by then, they'd be under bus driver Stimpsom Mink's supervision. The 6:17 am southbound freight train came through Duran, right on schedule, at the Route 3 crossing not far from the school bus stop...The cubs knew that after the train had passed by, the school bus would arrive very shortly....And sure enough, before the train had gotten out of sight down the tracks, Bus #17 arrived. A while after the cubs were off to school, it was time for Al to head out for work. "I'll speak to Nathan what we discussed last night", Al assured Marge just before they hugged and kissed. "I wish you luck", Marge said as Al got into the car to leave for the Laboratory. It was about 25 minutes that Al left the house, drove through the neighborhood to Route 3, traveled the 15 miles west and north on Route 3, and arrived at the laboratory complex on the edge of Encino where he works. By the time Al arrived to work, Poindexter Fox, Harold Wolf, and Greg Otter were already out at the time machine (this time with a utility building built around it) with Professor Nickolas Fox, Lola Binturong and Daren Margay. "Is Nathan in yet? ", Al asked Woodrow Raccoon. "He's in his office", Woodrow said to Al. Woodrow Raccoon, Lenard Wolverine and Johnny Ferret, who had been working on the machine, were needed to begin work on a high priority engineering assignment. This was to be the last day Nickolas Fox, Lola Binturong and Daren Margay can assist in repairing the time machine until they can come back again after the next two weeks...After all, Nicolas Fox and the two with him had their projects to design, build and experiment with out at area 51, related to Operation Sundial. Al came to Nathan Collie's office and asked, "Nathan, can I talk to you a minute?" "Come on in", said Nathan collie. What do you have?". "This is a matter concerning Clarence and another coyote cub of some neighbors of mine", Al began. Then Al explained to Nathan how the neighbor's female cub and Clarence are developing a bond of fondness for each other. "Sounds like they're in love", Nathan commented. "I'm sure that will have to break up when that time machine gets fixed". "This isn't about that alone", Al said. "The parents of the female cub encourages the friendship with her and Clarence. They talk like they have high hopes of them getting married some day. Even their teenage son has referred to Clarence as his future brother in law". "Have you and Marge approached these neighbors about this? ", Nathan asked. "I myself don't see that marriage your neighbors talk about as ever happening". "That's just it", said Al. "I want them to be prepared with the knowledge that Clarence would someday leave. But in order for them to know the truth about Clarence, they have to also know about the time machine". "Woah, Al! Do you have any idea what you're asking me to do here? ", Nathan Collie retorted. "You and I both know that machine is classified as top secret". "True. But Clarence is not top secret", said Al. "And don't think Marge and I haven't wondered how we'll explained the disappearance of an adopted cub when Clarence can get back to 2018". "I know logic would say you should have thought of that before you adopted him", Nathan Collie replied. "But I have to admit...Had it been Vicky and I who found Clarence on the side of Highway 54 that day, we would have adopted him as you and Marge did". "It's going to be an awkward situation for those neighbors to just suddenly notice Clarence gone one day, and don't know why", Al said. Nathan thought for about 15 seconds, then said, "I'm going to have to think this over, and figure things out. This situation doesn't leave me in an easy position...Al, I'll have a decision for you in about an hour". "I appreciate it, Nathan", Al said. As Nathan Collie now had a difficult dilemma to try to sort out, Al went over to the team he had been assigned to for the duration of an engineering project. After about an hour of working with fellow team members on designing, running calculations, and making sketches for components for a military spy plane, Nathan came over to get Al. "Come with me to my office, Al. I've decided on this matter", Nathan said. Once in the office, Nathan had Al close the door due to them discussing highly classified material. "This neighbor couple. Who are they, and what do they do for a living? ", Nathan asked. "They're Frank and Wanda Coyote who live down the street from us. They have two teens, Jerald and Dotty. Jerald's graduating high school in a few weeks. And there's Cheryl, their eight year old cub". "I take it it's Cheryl and Clarence who are in love each other? ", Nathan asked. "That's her", Al affirmed, then went on to say, "Frank use to work for the state highway department until a drunk driver struck him on a job site four years ago. Frank now collects pensions from the state and the driver's insurance company". "You see, Al. Hardly a candidate to be given a security clearance", Nathan replied. Nathan then went on to say, "Here's what we'll do. How I've decided we're going to deal with this does not constitute release of classified information...not technically anyway". "So you will authorize letting Frank and Wanda know about the time machine? ", Al asked. "Not the the time machine, A time machine", Nathan replied, then explained, "Everyone has heard of the idea of time machines. They've been written about in fictional literature, and they've been depicted in movies. However, it isn't everyone who knows we've been trying to design one over the past several years". "I see what you're saying now...Have them believe it's not our time machine. We don't even know where it came from", Al acknowledged. "Exactly", Nathan said, then explained, "I want to have your neighbors, Frank and Wanda, and their teens and cub, to ride out with us to the time machine. I want to have your family present there too, especially Clarence. Nickolas Fox and the two others leave back for Nevada this evening, but I'll ask Nickolas to wait...When do the cubs get home from school". "They get off the bus at about 4:45, give or take", Al answered. "No good", Nathan replied. "You and Marge pick up your cubs directly at school today, then come straight here. And have Frank and Wanda do the same. From here, we'll ride out to the machine...I'm going to let you take off at noon today. That should give you plenty of time to do all that". Nathan Collie then explained, "Now this is how it's going to be told to your neighbor family...That time machine came from 500 years into the future. As long as they think that, they won't get the wheels clicking in their heads that a time machine might already be on the drawing board...which you and I know, in reality, it is. They are to believe Clarence is from the year 2460...Remember I said, a time machine, not the time machine". "I have no problem with that", said Al. Nathan Collie went on to explain, "Your neighbors are to know absolutely nothing of Project Courier, or of any ambitions we have to eventually build a time travel machine. They are not to know of the existence of the tech drawings or of any documents related to those tech drawings...In fact, I don't want them to even have the opportunity to make eye contact with the papers those drawings are on". "I have to paw it to you, Nathan. That's an ingenious game plan you came up with. And it won't blow the lid off of Project Courier either", Al said to Nathan. "I figured 500 years is so distant, anyone would fail to see a connection to the present", Nathan replied. "And by the way", Nathan then said. "When you all arrive here, Frank and Wanda's family are to under no circumstances be allowed access into any of the lab buildings. If a cub has to use the potty, have them go behind a bush or a dumpster...Heaven knows it's bad enough that scientists working for us allow their relatives access in here". "We'll see you shortly before 4:00 then", Al said just before he started to make his way back to work. "Oh, one more thing", Nathan said to Al. "Even though no actual security breach is being committed here, it is still vitally crucial that Frank, Wanda and their son and daughters do not breath a word to anyone about a time machine or Clarence being from the future. Even if they dothink it's from 2460". "I am aware of that", Al agreed. "If Roswell ever found out, they'd be all over that like a nest of hornets". "Like they did back in June of '47 when that space ship crashed near Corona", Nathan affirmed. "The military wasted no time pouncing on that one". "Marge and I were teenagers then", Al said. "I remember on that night it happened, they tried to tell everyone it was a weather balloon". "Woodrow Raccoon and I were two of the scientists among several who got phone calls that night to help assist in the investigation of that crash", said Nathan. "I saw the weckage, and two of the seven bodies of alien creatures that night. Someone would have to had been a complete and total idiot to have seen that and still think it was a weather balloon". "Well, I have nothing else", said Al Coyote. "Neither do I", Nathan Collie replied. "We'll see you no later than 4:00. said Al. "See you then", Nathan said as Al began making his way back to his assigned project. Before getting back with his engineering team, Al went to a phone to call Marge about the arrangements Nathan Collie had discussed with him. With what there was to be discussed, Al used one of the secure lines, line 7...On a secure line, any six numbers always had to be randomly dialed before getting a dial tone to make a call, which prevented access to that line from another phone during the call...Anyone else would have to know what six numbers were dialed prior to the call in order to eavesdrop on a secure line from another phone. Al made sure no one was standing within listening distance as he explained the arrangements to Marge, and that he was getting off from work at noon. "Frank was going to take Jerald out today to see a car for sale", Marge told Al. "I'll need to tell Frank to change those plans then". "Yes. This is more important", Al affirmed. "And don't mention a word just yet about it to Frank and Wanda until I speak to you first. There's a certain way Nathan said they should know of this situation...Just tell them they need to be available between 12:00 and 1:00". "Okay", Marge acknowledged. "Meanwhile, I'll go ahead and call the school to have the cubs meet us there when they get out". "Okay. I'll see you at about 12:30...Love you", Al said to Marge. "Love you. I'll be waiting for you", Marge replied to Al just before they hung up. Al did have a few hours that morning to assist his engineering team in further design, calculations and group discussion of plans for the spy plane components they were developing...At noon, Al checked out from work and headed back to the house. Once Al arrived home from work, he explained to Marge the details that were discussed with Nathan Collie as to what Frank and Wanda were to be told about Clarence and the time machine. Then they went to Frank and Wanda's house to to tell them about picking the cubs up from school and going to see Nathan Collie at Horizon Innovations Laboratories. "What's this all about? ", Frank Coyote asked. All Al and Marge would tell Frank and Wanda at that moment was, "It's Important. And it is a concern to Cheryl and Clarence". "It's something you need to see", Marge explained to them. "But we have to see Al's boss at the lab first". "This all seems so strange", Wanda said to Frank. "What do you think it's about?". "I haven't the vaguest clue", Frank replied to his wife. The two coyote couples were long time friends and neighbors, and had known each other for years, thus Frank and Wanda agreed to trust Al and Marge and go along with what Nathan Collie had planned. At 2:00, Al and Marge proceeded in their 1960 Chrysler 300 to school to pick up Jed, Rex, Clarence and Donna, followed by Frank and Wanda in their six cylinder, 1955 Chevy station wagon to pick up Jerald, Dotty and Cheryl. At the parking lot of the school, Al instructed Frank, "After we leave here, we're going to the lab where I work". "I know roughly where that is. But I'm not exactly sure how to get there", Frank replied, then asked Wanda, "Do you know how to get there?". "Just follow us then when we leave here", Al said just as the bell rang for school to be dismissed school. As Al and Marge's cubs got in the car, Jed asked, "What's up?". "We're going to have Nathan Collie tell Frank and Wanda about Clarence being from the future", Al answered Jed. "Why is that? ", Clarence asked. "That's so when you're able to go back to 2018, it won't come as a sudden surprise to Cheryl", Marge said to Clarence. "We've noticed how close you two have become", Al told Clarence. "Frank and Wanda needs to know too. They've got these high hopes that you'll marry Cheryl someday". "I didn't know that", Clarence exclaimed. "Frank and Wanda's bubble being busted on that dream shouldn't have to come to them at the last minute either", Al further added. "Isn't Cheryl gonna be sad when she finds out? ", Donna asked. "She'll find out sooner or later", Marge told Donna. "It's better she knows now before feelings get any deeper". "Jerald and Dotty and Cheryl are getting in their dad and mom's car now", Rex pointed out, as Cheryl threw a kiss to Clarence as Frank held the back of the front seat forward for her to get in (2 door wagon). Jerald asked Frank, "Hey, Dad. Are they all coming with us to see about me getting that car?". "It won't be today", Frank said to Jerald. "Something else had come up". Al then cranked up the Chrysler and lead the way for Frank to follow with the Chevy wagon. Once they got to route 41 just on the east side of Estancia, Al took a short cut, back road that leads to Highway 60 to Encino...As the Chrysler and the Chevy wagon made it across route 41, everyone noticed that Gotham gold, '59, Cadillac Coup-de-ville squalling tires as it whirled north onto 41 with Biff Pitbull at the wheel, with his brother Richie and crony Gaston riding along. "Congrats to Biff Pitbull. I see he got his dad's Cadillac burning oil", Al said as white smoke can be seen coming from the exhaust as the three pit bull youths sped north on 41 like they were in a road race. In Frank and Wanda's Chevy wagon, Frank stated, "Looks like Biff done damaged the rings in that Cadillac his dad lets him drive". "I bet that's from that time we chased him down from The Hop that night he tripped that cougar cub", Jerald said. "Biff overheated that car, then kept trying to loose us until the car was so hot it quit running". "That will do it", Frank replied. "My gosh, they're such creeps", Dotty added. Just as they were turning onto Highway 60, Cheryl asked, "We have more room in our car. Couldn't Clarence come in this car and ride next to me?". "Aw, that's so sweet", Dotty said. "Maybe we can on the way home", Frank assured his younger daughter. "But right now, we have something important to look at". "I believe Clarence and our daughter Cheryl are just right for each other", Wanda said. "You see how much they're in love". "I know they'll make a loving couple once they're grown up", Frank added as he drove along following the Chrysler. "And you're right, Wanda. I can already see that". Meanwhile, in the Chrysler, Al and Marge explained to the cubs what Nathan Collie said Frank and Wanda can be told about the machine, and what they can't be told about it...And above all, have them think Clarence and the machine are from the year 2460". "Even if I'm only from 2018? ", Clarence asked. 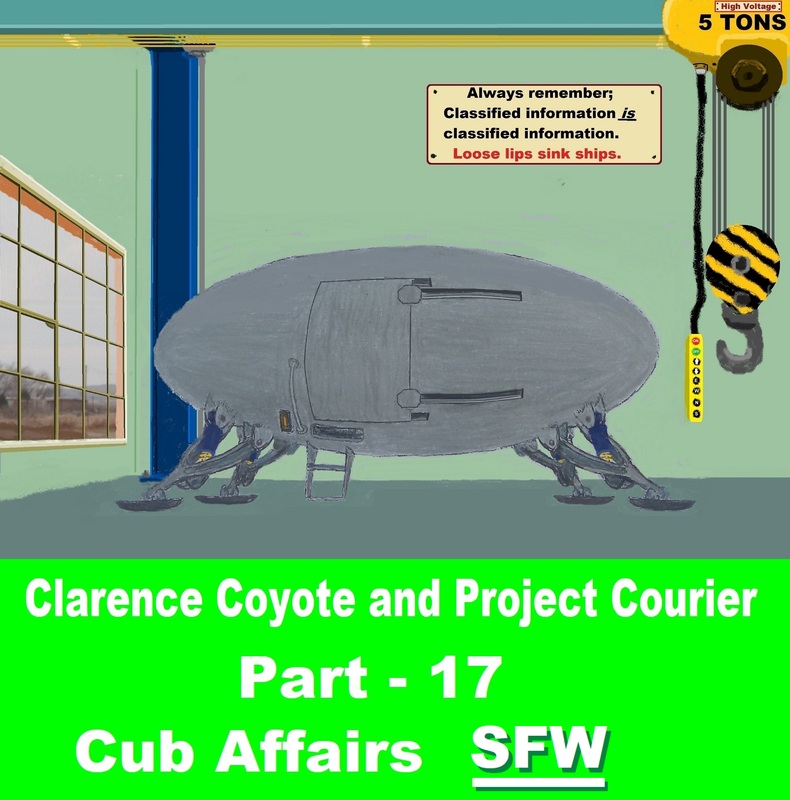 "We have to tell them that in order not to comprise the classified status of Project Courier", Al said to Clarence. Before long, both coyote families had arrived to Horizon Innovations near Encino, and were pulling up in their cars into the parking lot of the lab building where Al works. Al got out of his car, walked over to Frank and Wanda's station wagon, and told Frank, "This building requires a security clearance to get in. So just sit tight, and I'll be back with some associates of mine". "Okay. Well be waiting", Frank said just before Al went to the door of the building, entered his security code on the key pad, then entered the building. Within about seven minutes Al came back out with Professor Nickolas Fox, Poindexter Fox, Nathan Collie Greg Otter and Harold Wolf. "This is Frank and Wanda Coyote and the family", Al introduced the scientists as they approached Frank and Wanda's Chevy wagon. "You've probably never heard of me unless you were in the scientific community. I'm Professor Nickolas Fox", Nickolas said as he shook paws with Frank. "Can't say that I have heard of you. But I'm glad to make your acquaintance", Frank, sitting at the wheel of his car, said to Nickolas. "I'm his nephew, Dexter Fox", Poindexter greeted Frank. "But they call me Poindexter". "You're kinda cute", Dotty called from the back seat of the station wagon. "Oh thank you, mam", Poindexter thanked Dotty. "Hi there, Poindexter! ", Clarence called and waved from the Chrysler as Marge and the other cubs waved. "Hi there, Clarence little buddy", Poindexter called back. "I'm Greg Otter", Greg greeted Frank with a paw shake. "This is Nathan Collie. Our manager in charge", Al informed Frank. "Hello there, Frank", Nathan greeted Frank with a paw shake. "Glad to meet you, Nathan", Frank replied. "And how's the rest of the crew? ", Nathan asked. "We're fine", Wanda replied as Jerald, Dotty and Cheryl also affirmed. "And here's our 2nd in charge. Harold Wolf", Nathan introduced. "Pleased to meet you all", Harold greeted Frank. "Pleasure's mine as well", Frank Coyote replied, then asked. "By the way. What is this thing we're going out to see?". "You'll all know when we get there", Harold Wolf answered. "If we told you now, you'd never believe us". "Well...How does this effect us? ", Wanda asked. Nathan Collie assured Wanda, "Once you see what it is, you'll begin to understand the answer to that question. You'll just have to trust us". "We still need to tell Frank about the coming and leaving procedure at the site", said Al. "Oh yea", Nathan said, then explained to Frank, "We can't let others on the road see us coming and leaving there. The road has to be clear both ways. If someone is behind us, we slow down so they'll pass us. If they don't pass, we pull off and let them by. If we have to pass the site, then come back to not be seen, we do that". "I got that understood well", Frank affirmed. "Don't pull in if we see another car on the road". "Right", Harold Wolf affirmed. "And there's a rock formation there. Pull in behind it too". "We should be leaving now", said Nathan Collie, then asked, "Harold. Do you have the keys to the Falcon with you?...and to the building?". "They're right here", Harold showed the keys to Nathan. "Go bring the Falcon up here if you will please", Nathan asked Harold. Within a minute, Harold drove the Ford Falcon up to where Poindexter, Greg and Nickolas got in. Just before Nathan Collie got in on the front passenger's seat of the Falcon, he called out to Al and Frank, "Just follow us". Thus the Ford Falcon headed out, with the Chrysler 300 behind, and the '55 Chevy wagon bringing up the rear. After about 14 miles east on Highway 60, then 5 miles south on Highway 54 They arrived at the site. There were no other cars in site down both directions of the long straight away, so it was safe to pull off the Highway and enter the site. The two coyote families in their cars followed the scientists in the Falcon in behind the rock formation to where the utility building is that houses the time machine. As everyone got out of their cars, Frank said, "Looks like a garage building". Shortly after Frank Coyote had said that, he noticed a sign affixed to one of the horizontal sections of a roll up door, that read; "WARNING. RESTRICTED AREA. Unauthorized entry is in violation of federal law punishable by 10 years in prison, and/or a $10,000 fine". Harold Wolf seeing that Frank had noticed the warning sign, assured Frank and his family, "Relax. We are authorized to be here", as he unlocked the pad lock from one of the roll up doors, then raised up the door. And there it was...The time machine...The door of the machine was now being left open now that a building had been built around it. "What...is that gizmo?! ", Frank exclaimed. "It's not a gizmo. It's a time travel machine", Nathan Collie answered Frank to much of the suprise of Frank and his family. "A what?...Did I here you correctly?! ", Wanda asked. "That's exactly what it is", Professor Fox affirmed as Al and the other other scientists agreed. Frank, his wife Wanda, their teens Jerald and Dotty, and their cub Cheryl, gazed in awe at the machine, as they also noticed the clear energy reactor tunnel inside the craft, running from the center of the ceiling to the center of the floor, with it's aqua colour energy rings travelling through it, and the cobalt light beam running through the center. "You were right back at the Horizons Laboratory when you said we would not have believed it", Frank Coyote said to Harold Wolf. "But seeing is believing". "Hey Cool. A for real time machine? Can take a look inside? ", Jerald asked as he began climbing the machine's two step sterrup on his way inside. Greg Otter grabbed hold of Jerald's arm to stop him, and told Jerald, "We can not allow that". "Jeepers wizz. Why not? ", Jerald replied. "It's because...well...it's to dangerous", Greg answered. "It's not safe to be in there right now, Young Jerald", Poindexter affirmed. "Inside that craft is a dangerous place to be at this time, Jerald", Nickolas Fox assured Jerald. "Well...Sure...If you say so", Jerald said as he stepped back down from the machine's step sterrup. "You can see enough of it from out here, Son", Frank assured Jerald. "Stay out here where it's safe". Actually the truth was; There was no physical danger inside the time machine...Because Project Courier was a classified project of top secret status, the scientists didn't want Jerald inside looking around. "We thank you for having us privileged to see this marvelous craft", Wanda thanked the scientists. "But your boss, Nathan Collie, told me we would understand how this effects us". "It's time I need to tell you all that", Nathan said to Wanda, then went on to explain, "Al has told me how close his step son Clarence and your daughter Cheryl are...in love should I say". "Frank and I believe they'd be such a happy and loving husband and wife someday", Wanda added. "I'm sorry to say that's not possible", Nathan Collie began breaking the news to Frank and Wanda and family. "Clarence Coyote is not simply an Orphan adopted by Al and Marge as you've always thought. He arrived in this time machine from the year 2460"
""He's from the future? !...Like Buck Rogers Kangaroo?! ", Dotty exclaimed. "Wow! Like in Flash Gordon Otter?! ", Jerald added. "Well, those are Hollywood fictitious characters", Nathan said, then continued, "When Clarence came here from 2460, the time machine suffered some damage. As soon as we can get it fixed, Clarence will be able to go back to the futire to be reunited with his original family". By now, Cheryl was in tears. "I always want you", Cheryl said to Clarence as they hugged each other. "I'll always love you", Clarence said to Cheryl. "But I want to be with my mom and dad...my actual mom and dad". Cheryl, understanding that Clarence was presently separated from his original family, said to Clarence, "I'm gonna miss you when you go". "Well...So much for Clarence being a future husband for Cheryl", Frank mentioned. "He would have made a swell brother-in-law", Jerald said. "I see what you meant when you came and told me that this morning", Nathan Collie said to Al Coyote. Frank did eventually ask, "I never got around to asking until now. But how did you all manage to get that machine through a...looks to me to be only an eight foot wide door, into that garage. "We didn't", Nathan Collie answered. "The building was built around it to keep curosity seekers from finding it...Which reminds me...No one is to tell anyone else about what you all seen here today". Nickolas Fox added, "If knowledge of this ever got around to Roswell, this time machine would be captured. Then everyone in the scientific community, including nearly everyone within several counties of here, would be questioned by NASA, the FBI, the CIA, Air Force officers from Roswell, and even the New Mexico State Police as to what anyone knows about a time machine and a coyote cub from the future". "That would be a nightmare", Frank mentioned. "More than you can imagine", Nathan added. "You heard that", Frank told Jerald, Dotty and Cheryl as they all agreed. "Don't tell anyone about this...Not even your best friends at school". It was then agreed by everyone that Cheryl and Clarence can continue to be lovers as long as Clarence is in the present 1960... However, it was to be with the understanding that their romance will be a good and wonderful and beautiful thing until Clarence can go back to the future...Which to say, 'it will be good while it lasts'. With all that now said and out of the way, Harold Wolf pulled the roll up door to the building back down and locked it back with the heavy duty pad lock. Then as Poindexter Fox stood look out for cars approaching on Highway 54, Al and Marge's family pulled out and headed south to Duran, and Frank and Wanda's family did the same. Then, Poindexter Fox made sure there were still no more more cars approaching on Highway 54 as he called out to have Harold Wolf drive the Ford Falcon up to where Poindexter got in to head back to the lab. In the following weeks to come, Cheryl and Clarence would spend more time with each other...The two young coyote cubs wanted to make the best of making a good thing last before the day would come that Clarence could go back to 2018. That Thursday evening after school, Frank Coyote took his teenage son, Jerald, out to see another car for sale. It was a 1952 Pontiac in nearly pristine condition...It was green, two door, with a 103 horse power flat head six cylinder, and manual transmission. It was a blessing the car wasn't equipped with an automatic transmission...The first of the GM automatic transmissions from about 1950 were those very trouble prone, two speed Powerglides. Like Frank had said to Jerald when they were looking at 1950 Chevy with an automatic a couple a days ago, "Those early GM automatics of 1950, 1951 and 1952 are nothing but a two speed slush box. After they had looked at that 1950 Chevy a couple of days ago, Jerald told Daddy Frank, "Gee Dad. I'm glad you caught that". Frank told Jerald, "When you saw a fairly new GM car back then that had one of those transmissions. And someone had a 'for sale' sign on it, you already knew what was wrong with it". The kinkajou who had the 1952 Pontiac up for sale was asking $175 for the car. After the test drive, Frank Coyote bartered with Lopez Kinkajou, "We'll give you $150 for it". "I don't take less than the $160, my friend", Lopez insisted. "We'll give $160", Frank agreed. Lopez Kinkajou and Frank Coyote agreed on $160, thus the sale was made, the title was signed over, and a bill of sale was written out by Lopez Kinkajou...Jerald Coyote now had his first car. 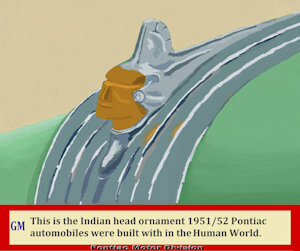 Of course, the Pontiac for a few decades had that 'Indian' head hood ornament, up till 1954 being the last year Pontiac automobiles were made with that ornament on the hood. In the human world, that ornament would have been depicted in a likeness of a human Indian head. 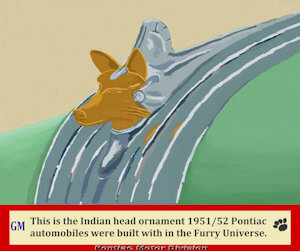 However, being this is the Furry world, the Pontiac automobiles of that time era had hood ornaments that depicted a likeness of a wolf Indian head. Frank and Wanda allowed Jerald to take the day off from school to take the trip with Daddy Frank to Estancia to get Jerald's car registered and tagged for highway use (insurance was not required back in those days). At the time Jerald got his car, there was only one week of school left before the summer vacation begins...That would be the week that Jerald will be driving his own car to and from school, and no longer riding the bus. Now that Jerald Coyote got his first 'set of wheels', he was not about to tear it up like Biff Pitbull did to one of his dad's Cadillacs...or like the hot rodders do to their cars after school everyday...It took too long for Jerald to get his first car to be doing that. That Friday evening, Jerald made arrangements to pick up his fiancee Cindy to ride with him in his newly acquired car to The Hop. When Jerald pulled up to Cindy's home, Cindy's parents, Fred and Charlot was impressed with Jerald's car. And Cindy was so delighted that her boy friend Jerald had finally got his own car. Cindy was surprised, her saying, "Oh, Jerald. Is that your car". "It sure is", Jerald replied. Cindy's Dad, Fred, asked Jerald, "How much did you give for that car?" "The car looks like it was kept up nice", said Fred. "That's a pretty good deal you got on it". "That's a very nice car", Cindy's mom, Charlot, said. Of course, Jerald and Cindy didn't stay out all that late at The Hop that night...Tomorrow evening was the night the high school for Torrance County has their senior prom. Cindy, also a senior, attends the high school in Vaughn, being that she lives in a different county, Guadalupe County. Jerald had already invited Cindy to his prom, which Cindy had accepted his invitation. Where as Jerald's last school day is Friday, June 3rd, and Cindy's last school day is Thursday, June 2nd, both schools would be having their proms that Saturday evening on May 28th...Of course, Cindy chose to attend the Torrance County high school prom with Jerald. Clarence Coyote and his female friend, Cheryl, become closer as friends..
Cheryl finds out about the time machine. Jerald Coyote gets his first car. Little 1st grader, Gail Skunk, disrupts class at school. Parts of this story are also in the pool named "Project Courier".